i caught up with the mario kart series by playing through mario kart 8 on wii u, although it was definitely more out of the need to be a completionist than any real interest in the game, sad to say. the previous entry in the series, mario kart 7 on 3DS, left me feeling pretty bored and jaded, and my overall experience with mario kart 8 didn’t really leave me feeling much different. for me the pluses are all fairly minor. i appreciated that like its predecessor this game tones down the relentless onslaught of attacks by CPUs that was present in the wii edition. it’s nice to see the koopalings gain even more prominence by being included, although disappointing that it was at the expense of such long-time favorites as birdo. the game looks great in HD, although graphics have never been the main selling point for any game for me, and the use of jazzy live music is a nice addition. the inclusion of stamps for use in miiverse is a nice motivator to do some more single-player cup racing. the video highlights features are nice to have, although i haven’t been motivated to save any of mine, or view anyone else’s really. (similarly, the nerfed battle mode may have been a deal breaker to many, but i’ve never really been that interested in those modes anyway.) the new anti-gravity sections (which changes collisions such that you get a speed boost from them), “super horn” item (which allows you to destroy the dreaded blue shell), and upcoming unlockable costumes via amiibos are also nice to have, although none of these features are game changers. basically everything else about the game is the same old story. coin collecting, custom parts, new and retro tracks (very few of which felt that memorable to me), air and water sections, motion controls, it’s all stuff we’ve seen before. the formula has really grown stale for me, and even though the previous entry was released two and a half years ago there wasn’t anything about this edition that excited me. the one thing i wasn’t expecting to enjoy so much was the physics, which make the karts feel like they have real weight, but that’s not enough to make me give the game more than a passing grade. even amongst nintendo series, the mario kart series has never been one that was very focused on innovation. the expansion of the universe to include other nintendo properties via DLC had potential, although i haven’t found the first batch of DLC to be that worthwhile personally. i’ll have to see if the second batch of DLC fares any better, or if i’m going to have to wait for the inevitable next installment to give me something to get excited about. 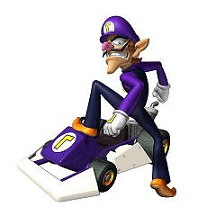 next up in my series of posts where i rank series that i’ve played all the games in is the mario kart series. (incidentally the previous posts looked back at the mario and metroid series.) i played the series pretty much entirely sequentially over the span of four years, and although the first entry didn’t really grab me, its sequel, mario kart 64, is what made me a believer and a fan. the first entry in the series was the first of its kind and started a whole genre, and the series continues to be hugely popular. it’s gotten a lot of flak in more recent years, though, for becoming more casual: all too often the first-place driver will suddenly find her/himself in last place at the last moment of a race. but it’s still a lot of fun, and in general i appreciate that even if you make a mistake you still have a chance of winning the race. here’s a look back at the series via my ranking of the seven games in the series. for this post i’ve enlisted the help of alienjesus to provide a contrasting opinion. so without further ado, 3 … 2 … 1 … GO! mario kart 64 (N64): as i mentioned, mario kart 64 is really what made me become a fan of the series. although it’s prob. among the easiest in the series, like many sequels it took the core concept and greatly expanded it. the tracks went from the almost-completely flat tracks of super mario kart to ones that had bumps, jumps, and steeply angled twists and turns, along with many more moving obstacles to contend with including penguins, cars and trucks, boulders, a train, and a giant yoshi egg. 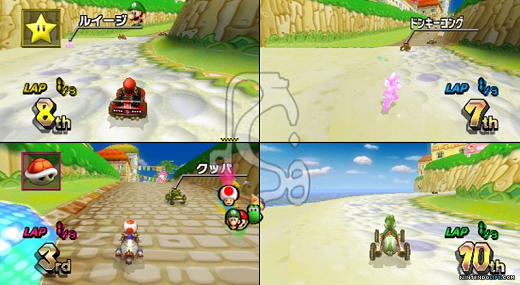 the game introduced new types of course locations that have been built upon ever since, including farm, desert, stadium, jungle, and city tracks. the balance of items feels “just right”, and i think many people would agree that it’s one of the standout entries in the series, if not the best. Mario Kart DS: Definitely the best Mario Kart. This is the game that perfected the series, and got everything right. The physics felt perfect, with well judged steering and a better sense of speed than most Mario Kart games. The item selection was better balanced than others in the series (I’m looking at you MK Wii and Double Dash), and the track design was at its peak – Tick Tock Clock, Desert Hills and Airship Fortress are some of the greatest tracks in the series. Add in bonus challenges, the first major appearance of remade retro tracks, 8 player possibilities and the series’ first online mode and you’ve got an amazing game that manages to improve on a classic formula. 2 mario kart wii (wii): i’m torn about this choice. if you read my post at the time, i was extremely frustrated by how the profusion of items makes the whole experience chaotic and obnoxious in the single player grand prix mode. of all the games in the series i’ve played this one the most, though, thanks to the wi-fi modes, which my nephew and i regularly use. it’s simple for us to race together, and it’s been interesting to see how accurate the VR (vs. ranking) is. although many people quickly gave up on the motion controls, i think they’re what makes the game a wholly unique experience and i don’t consider them to be a handicap. 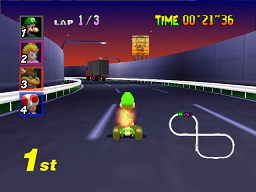 the game took the 3-D tracks of mario kart N64 and took them even further by adding in trampolines, more ramps and boost pads, and half pipes. it features quite a few now-classic tracks, including mushroom gorge, coconut mall, DK summit, and koopa cape; it looks great; and the number of characters and karts/bikes is an added bonus. although my first experience with the game was more frustrating than fun, nowadays it’s clear to me that it’s one of the definite high points of the series. Mario Kart 7: This one seems hit and miss for most, but I love it. Whilst the underwater mechanic never did much for me, the new gliding mechanic works great and a well judged glide can put you way ahead of the pack. The reduction back to 8 characters from the Wii game’s 12 is much appreciated, and causes a little less of that ever-present Mario Kart rage when you get ruined by items on the last lap. This is also helped by the reduction in the number of items to use. The character selection is odd, and not all of the tracks are hits, but there is a nice selection of unique tracks like Shy Guy Bazaar to keep things fresh. Plus, the new three stage tracks are a nice change of pace. 3 mario kart: double dash!! (GCN): this game gets a bad rap, and there are probably several reasons, including the “double” mechanic which is somewhat useless as a 2P experience. i never tried that myself, but as a single-player feature it adds strategy and adds to the game’s uniqueness. people also seem to complain about the return of character-specific items, which i thought was a nice change for the series. the tracks really didn’t feel that unique, but the game looks great and it brought in a few of my favorites to the series (birdo, waluigi, daisy, plus the creation of toadette). i’m probably ranking this game a bit high, but i always appreciate it when developers try to do things a little differently. Mario Kart: Double Dash!! : This one was a real favourite of mine when I was a teenager. The track selection may be one of the smallest in the series, but it’s full of classics like Baby Park, Wario Colosseum and Yoshi Circuit. Some people don’t like this game’s comparatively heavy physics, but personally, I love them, and always go for the heaviest cart. The mix-and-match character selection allows for everyone to choose a weapon or character set-up to suit their tastes, but the character specific weapons tend to be a bit overpowered and chaotic. Even so, it still manages to be significantly less frustrating than the Wii game’s never ceasing bombardment of pain, and sits pride of place in number 3 on my list. 4 mario kart DS (DS): this is the first of the handheld titles in my list. 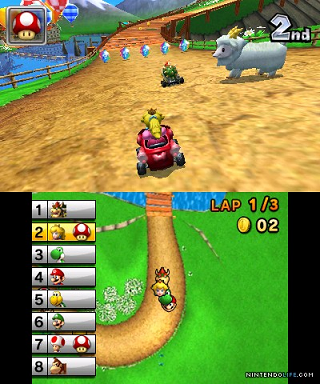 the handheld games in the series have always felt like they closely followed the mold of their console predecessors, but mario kart DS did have some things to set it apart. it features a mission mode, which does a pretty good job of expanding the overall experience. 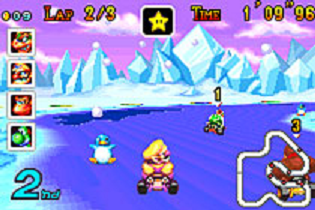 it was the first to feature a wide variety of retro tracks (the GBA iteration included all the SNES tracks, but the DS edition draws from all the previous entries in the series). it was also the first to introduce wi-fi matches, although that mode was pretty much a wash for me since winning relies on snaking, which i find completely pointless. i could’ve easily put this third in my ranking, but i just didn’t find the experience to be as memorable as double dash due to the tracks being too closely based on the N64 tracks (with the exception of delfino square, which remains a favorite). Mario Kart 64: This one was a tricky decision for me. Honestly, I’m not that taken by most the N64 game’s track design, which tends to be a bit sparse, nor its slow physics and odd feeling power boost system. With only 8 characters and 16 tracks it also tends to feel a bit lacking in content compared to the later games in the series. Why did I rate it at number 4 then? A few reasons – first of all, despite there only being 4 of them, this is the game with the absolute best battle mode arenas in the whole series (with Double Dash coming in second). Block Tower and Double Decker are classics that never fail to break up friendships. Secondly, though most tracks feel a bit bland, some of the more interesting ones are classics – Yoshi Valley comes to mind straight away. Finally, this is the last game in the series where weapons were more toned back – even the blue shell, which debuted here, was far better balanced here than it ever has been since. 5 mario kart: super circuit (GBA): next up would be mario kart: super circuit. the first handheld mario kart, this game felt like a step back for me since all the tracks were completely flat like in the original SNES game, and even despite that fact they weren’t very memorable. the game was the first to introduce a rankings system, which increases replayability (as well as insanity), but in the end i think what gives this game the edge is that instead of just being a remake of the original SNES game, it’s basically a remake with double the amount of content, which is a pretty sweet bonus. Mario Kart: Super Circuit: This is the game that fought MK64 for the number 4 slot for me, and I’m sure several people with think I’m nuts to not have this one in last. The game has some weird slidy physics and loses out on the multiplayer front too – it’s pretty tricky to find 3 other people with the game and link cables who will want to play this with you nowadays. However, some of the tracks in this entry to the series are among the most creative and interesting in the series, yet most have never made it into one of the retro cups of the more recent games – Sunset Wilds, Cheese Land and Ribbon Road. It’s also the last time we saw the Boo weapon, which I sorely miss. Nothing was more fun than stealing your friends own red shell and nailing them with it. 6 mario kart 7 (3DS): i find it surprising that quite a few people have called mario kart 7 the best in the series. i found the game to be a huge bore in the single-player mode due to its astoundingly low difficulty level. 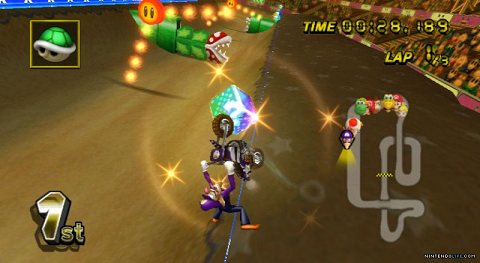 the addition of gliders, underwater sections, and customizable parts is hardly noticeable, and although i appreciated that they toned down the number of opponents and thus the amount of items that get thrown at you every second compared to the wii edition, there’s just too much time where nothing interesting is happening at all (this is exacerbated by the addition of tracks that are one continuous course instead of multiple laps). the “lucky 7” item is more confusing than fun, and i found the new tracks to be entirely ho-hum. it’s possible i’ll get more into the game the more i play with others and over wi-fi, but right now it’s easily one of my least favorite in the series even though it introduces lakitu, one of my favorite new playable characters to the series. Super Mario Kart: The original, but certainly not the best. Whilst still an enjoyable game, Super Mario Kart has been improved on so much that it feels severely dated nowadays. Ignoring the obvious slidy physics, the tracks feel short and limited, and way the game plays in split screen even in single player is irritating. The worst aspect of all is the way the game deals with CPU characters using weapons though – not only can they activate them at any time, but they also tend to be unique and overpowered exclusive abilities. Having one of the Mario Brothers as your main rival and constantly activating his invincibility is a pain in the neck. Certainly worth a play, but more of a novelty these days. 7 super mario kart (SNES): the game that started it all, but also the game that is the most inaccessible and unforgiving by modern standards. i basically haven’t touched this game since i played it four years ago, but the amount of rubberbanding by the AI is a common complaint (although i didn’t have too much of a problem with the fact your opponents get unique weapons and you don’t). at the time i also hadn’t really mastered drifting, but now that i have it should be interesting to give this one another go. Mario Kart Wii: You probably all saw this coming; I’ve been bashing this game enough during the article for it to be pretty apparent. 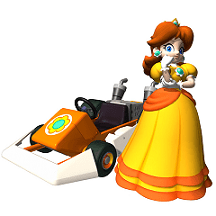 The worst aspect of Mario Kart Wii is that it’s not a bad game – the courses are decent enough (Koopa Cape, Mushroom Gorge and Maple Treeway are awesome), there’s a nice and big, if odd selection of characters (Baby Daisy? Why? ), the 12 player battle mode is chaotic fun and the online multiplayer is pretty well done. The problem is that you’ll be too busy getting constantly slapped around the face to care. With more overpowered weapons, more item blocks, more characters to use them and a new way of dealing with CPU characters’ items, it’s not uncommon to go from first to last in this game as you get pummelled by every weapon possible all in a row. What’s worse than going from first to fourth because of a Blue Shell? Going from first to twelfth because of a blue shell, a red shell, a bob-omb, a star and a bullet bill in the space of 10 seconds, with a thundercloud left above your head to boot. Bah! 8 – Mario Kart Arcade GP 1 & 2: Throwing these in here just for a mention to be honest. I honestly don’t know if I think these are worse games than Mario Kart Wii, because I haven’t played them enough. What I do know is that from the little I’ve played, the tracks are dull, the turning feels weird, the items are odd and they really feel more like Mario Kart knock-offs than real Mario Kart games. There’s supposedly a third on the way which includes the glider mechanics from Mario Kart 7. I don’t imagine it will be any more interesting. interestingly enough, it looks like alienjesus and i agreed pretty closely, with only our opinions of mario kart 7 and mario kart wii being drastically different. anyway, thanks to him for helping out, and for two more contrasting opinions, see this article at craveonline and this one at digitallydownloaded.net. don’t know when i’ll actually get around to replaying the entries in this memorable series, and hopefully it won’t be too long before we hear more about the new entry, for wii u. 1) at the top of the list is mario kart wii. although i found the game to be more infuriating than fun at 150cc, the game has several advantages over the other wi-fi games on wii, the main one being that instead of just two-player matches against each other, we can play against up to 10 other random opponents. it’s a bit humbling to see how bad i am at the game compared to many others (although i wonder how much more time they’ve put into it, and i do have the disadvantage of always using the wii wheel), but both of us place high enough enough times that we don’t get too frustrated at how badly we’re getting beaten, despite our low overall ranking (measured by the VR score). it’s a little annoying that we usually can’t join each other’s current race right away, even if the other person hasn’t actually started racing yet, but aside from that the always changing competition and variety of tracks, karts, and characters keep this one pretty high on our list. 2) next up would have to be super smash bros. brawl. i’ve waxed poetic about the game several times already, but my nephew likes experimenting with the huge number of characters. the game was easy for him to get into, and his skills have continued to improve fairly steadily. we usually play a 2 vs. 2 team-up against the computer, but every once in a while we mix it up with a 1 vs. 1 match or a multi-man brawl. it would’ve been nice to have been able to have a 2 vs. 2 team match against random opponents, but it wouldn’t be as fun as mario kart wii‘s matchups anyway. 3) in third would probably be tatsunoko vs. capcom: ultimate all-stars. i got this for him this past christmas, but already we’ve had a lot of fun with it. it’s his first experience with the street fighter series, and the simplified single-wiimote control mechanism makes it almost as easy to get into as brawl. it’s still generally more complicated than brawl so it’ll be interesting to see which he ends up preferring, but there’s a nice variety with the characters (although we still haven’t really figured out why some characters seem so useless). i personally would rather play brawl, but i’m interested in spending more time with this game myself. 4) a more-distant fourth would be animal crossing: city folk. i personally would rather play this than some of the other wii wi-fi games, but i can see how a 10-year-old boy would prefer something with a bit more action and competition. we don’t play it that often, but whenever i do he’s always perfectly happy to do so and enthusiastically runs around shopping, fishing, and catching bugs. i probably get more out of it than he does, and in part thanks to our sessions together i’ve reached some milestones since my post a year and a half ago including just a few weeks ago finally paying off the last of my mortgage and finally finding the last fossil (i’m still hunting for two more pieces of the robo series). it’s not his first choice, but he seems to fully enjoy it regardless. 5) rounding out the list is excitebike: world rally. the game is perfectly enjoyable, but as a wiiware title it just doesn’t have the depth that the other games do. part of why we don’t play it that much is that, despite holding it in extremely high regard, i lost interest in it after i got all the highest medals. but wi-fi matches against random players are fun (and it’s not difficult for us to get put into the same room), and my nephew gets caught up in playing more matches so that he can unlock the next color (not sure why he finds that so appealing, but he does). a perfectly good, albeit limited, alternative to the other games mentioned. and to finish up, for some additional suggestions here’s a list of recommended wii wi-fi games that was the first hit i got from a search online. as soon as i got my last gold 150cc trophy on mario kart wii i sat down with mario kart 7 for 3ds, released almost a year ago. i had played the game very casually before then, but i finished playing through the new tracks … and was amazed at how bored i was. i got 3* rankings on the 50cc cups on my first try through them, and although i’m caught up on the series now and am a series vet, i’ve never had such a mindless experience with mario kart as this game. (again, i’m clearly not the only one who thinks so, as this forum thread indicates.) the new courses are extremely boring (the only major change being that some now are one long track broken up into three sections instead of having three laps), and even when i skipped the 100cc cups i still got stars in the 150cc cups easily. even though the wii version was really frustrating due to the level of chaos, it had enough features to keep me engaged. in comparison, this version feels like it really doesn’t add anything essentially new. the new customization and ability to glide in the air or go underwater are completely superficial additions and don’t change the gameplay at all. miyamoto even admits as much in an interview with famitsu where he says: “the core of Mario Kart is pretty solid by this point and I think it’s safe to have it evolve in a pretty staid and traditional manner”. one of the most concrete admissions to phoning a game in that i’ve seen, and extremely disappointing coming from miyamoto who has shown his insistence on refinement and obsession with detail in many other areas before. the 1st-person view is gimmicky and i doubt anyone will spend much time with it, and the graphics feel bare and the colors lack the vibrancy of the rest of the series. the streetpass mode allows you to exchange ghosts with people you pass, but as with mario 3d land i really don’t really see the appeal in competing against people you don’t know and who won’t even see your result. there are some cute new characters (e.g. lakitu and wiggler) and i’m glad they went back to 8 drivers instead of 12, and i’m also glad the AI doesn’t overwhelm you with items all the time like in the wii version. still, this is easily the least fun and interesting game among the mario kart series, and in fact is probably one of the most disappointing main-series nintendo games i’ve played in a while. i’m astounded that others have scored it so highly, since it seems obvious to me that the series, like many other nintendo series lately, really needs a shake up. nintendo has really been testing my loyalty lately; i’m going to be waiting on getting a wii u until they release something more interesting than just another mario platformer. who’d have thought that i would ever have been bored by the number of mario games being released? but 3 that fail to push the envelope in little more than a year is just too much for me. there are certainly plenty of great games that i still need to catch up on so i’m not at a complete loss of excellent games to play while nintendo continues to falter, but many more disappointments like this will make me even more wary of investing my time in a company that seems to no longer be synonymous with huge innovations and seems to be content to make minor, inconsequential updates as with this game. although mario kart 7 was released only a few months ago, i’m still catching up on the last few entries in the series. the next one up for me was mario kart DS. the game got rave reviews upon its release six years ago, and it does offer some new features. first off, the game introduces wi-fi races and battles, neither of which particularly interest me, although the emphasis on snaking in this game apparently makes that experience very uneven. missions were a mild diversion, although they got rather repetitive, and it annoys me that full mastery of snaking, which i consider to be an optional technique since it’s never mentioned anywhere in the game or its manual, is required to 3-star rank some of them. the retro cups, which include reprises of tracks from the four previous games in the series, were a great addition and have since become a series staple, although only having 3 laps for the SNES tracks often made them feel more frustrating than they could’ve been since the idiosyncratic brevity of those races gives you little room for error. the game also introduces a new roster of karts to choose from with three new stats — handling, drift, and items — which adds some variety. in terms of the “difficulty”, by now the frustration of last-second blue shells is par for the course. the inclusion of ranks, introduced in super circuit, definitely adds to the replayability, but i’m not into racers enough to have much interest in chasing the highest ranks. 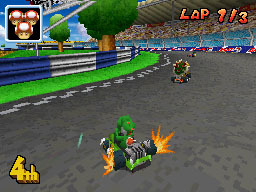 the game features the kart debut of a pair of characters, one of whom was a complete surprise, as well as a couple of new items. despite all these additions, the game feels strongly tied to mario kart 64 since it ignores the gameplay introduced in the gamecube iteration. the new locales are enjoyable, but too many of the new tracks feel like retreads to me. it’s certainly impressive to see gamecube tracks reworked for the more-limited DS, but in terms of the core racing experience there wasn’t much that really grabbed me. on the up-side, the game did make me appreciate the new ideas introduced in the gamecube game. this one ends up ranking in the middle of my list of favorites in the series so far, and i’m hoping the wii (and 3DS) iterations provide more of a progression for the series as a whole. even though i’m not a huge fan of racers, for the most part i’ve been enjoying working my way through the mario kart series. the games provide fairly worthwhile challenges while allowing you to recover from mistakes through the use of items, which generally makes the experience more fun than frustrating esp. when compared to other racers. i had skipped over mario kart: super circuit for GBA and played the gamecube entry, but then i realized the DS and wii games include some courses that originated in super circuit and felt i should backtrack to it before continuing on. the main reason i had wanted to skip over MK:SC was because i knew that it was going to be similar to the SNES version, so it’s not surprising that when i started playing it i really rather disliked it, particularly because of the flatness and sameness of the courses. the majority of the courses are riffs of the original SNES courses anyway, and i found myself missing the variety of the N64 and gamecube versions. but by the time i’d gotten 1st on all the cups i was able to appreciate, although still not quite love, the limitations of the hardware and somewhat enjoy the retro (GBA) on top of retro (SNES) feel of the game. the ranking system definitely adds to the replay value and makes the game much more worth playing (i’m still not quite convinced that collecting coins is more than just a tiresome chore, but i do like that it forces you to drive different routes through the course), and the inclusion of all the SNES courses is a great bonus. while replaying the SNES courses i was amazed at how extremely short they are; no wonder they require five laps instead of what has become the customary three. since the SNES courses are so short, even though they’re extremely similar to the new GBA tracks those cups have a distinct feel. incidentally, for anyone wondering, i used wario throughout the game. usually i don’t use heavyweights, so either the game is easier than the others or my skillz have improved, because he turned out to be a good choice for me, despite his weird voice (apparently the same as the japanese N64 mario kart voice). another bit of trivia: the game was developed by intelligent systems, much better known for their work on some of my favorite series of all time, namely fire emblem and advance wars. in the end mario kart: super circuit turned out to be a step back in more ways than one. aside from the ranking system (it’s with mixed emotions that i note that ranking appears in the DS and wii versions as well) and the first appearance of retro cups (oh, and a 180-degree move you can do by pressing the A and B buttons simultaneously), the game didn’t really introduce much that was really new to the series. still, i suppose as the first portable mario kart it’s great for what it is, namely a sequel instead of just a straight port, and it was nice to revisit the original SNES experience. definitely looking forward to the DS and wii versions, though. vroom! 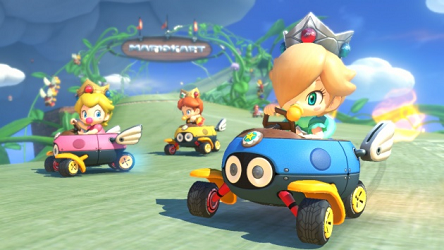 these mario kart: super circuit links are leaving you in the dust!